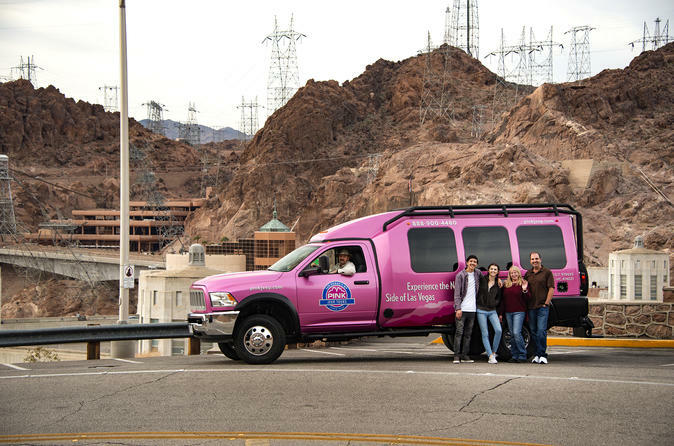 Travel with a passionate tour guide in a 10 passenger Tour Trekker to the most popular sight-seeing attraction in Nevada. Your expert guide will narrate your tour from start to finish and give you a unique perspective on the Hoover Dam's history, surrounding geology, and more. Travel with a professional tour guide in a 10 passenger Tour Trekker to the most popular sight-seeing attraction in Nevada. This custom built vehicle is equipped with plush leather captain’s chairs, extra-large viewing windows, and a flat screen DVD player for the ultimate in touring style. You’ll enjoy the beautiful exhibits at the Visitors Center and a live presentation of the Dam’s construction and history. Your expert guide will then lead you into the heart of the Dam where Bureau of Reclamation employees will guide you down to witness the power plant and its massive generators. Includes hotel pick up and drop off, water and snacks.